If you’re planning to create your own cryptocurrency and keeping it alive in the cryptocurrency world, our new software platform is sure to stun your mind! You can now make your coin without any technical knowledge, our program automatically generates the source code and publishes it on the Ethereum main network. All this happens without any human intervention and technical knowledge. 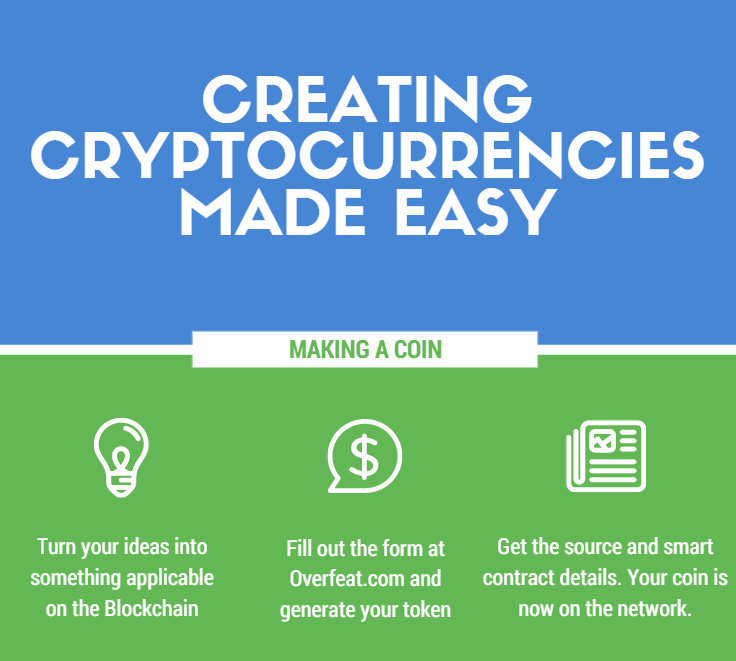 To create your cryptocurrency in no time, go ahead and fill out the form below with the necessary information and your token will be created immediately after the payments - keep an eye on your email inbox. Let's begin by knowing you you are. Let's know a bit about your token now. Let's find out what you want. Pausible Transfers: Add Pausible Transfers — +$25 USD No, I don't need it The contract owner can resume and freeze transfers for all users. Multi-Transfer: Add Multi-Transfer — +$50 USD No, I don't need it You can transfer to more than 300 users in one transaction. Saves up to 21,000 gas for each user. Minting and Burning: Add Minting and Burning — +$35 USD No, I don't need it The contract owner can produce and burn tokens. Time Lock-In: Add Time Lock-In — +$50 USD No, I don't need it To ensure the trust of the community, contract owners can lock in their tokens for a specific period of time. Amount To Lock: How many funds should be locked in the contract? Time to Lock For: 1 Month 2 Months 3 Months 6 Months 12 Months 16 Months 24 Months For how much time should they be locked in for? I agree to allow Overfeat to store and process/handle the details submitted in this form. Furthermore, I also agree with the Terms and Conditions and the (No) Refund Policy. Ethereum based tokens and decentralized applications are written in a programming language called Solidity. It's used to execute smart contracts on the top of the Blockchain. The cryptocurrency market is making huge strides every day and now is the best time to create your own cryptocurrency. Our service is crafted for businesses and individuals looking for a quick and secure method to get their custom Ethereum asset, token or coin made. This page enables you to create your own cryptography digital asset quickly in no time. Our code smartly generates your token based on your preferences and settings you chose. While all this flexibility, the code is still secure and available for further editing - it's pure opensource. No backdoors, no hacks. You've the option to choose from over 4 great features while not burning a hole in your pocket. Based on the recommendations and suggestions of our visitors and users, we have crafted this tool to make the process of making cryptocurrencies, tokens and assets easy, fast and hassle-free. Overfeat brings you the much awaited opportunity to create Ethereum tokens without any technical knowledge at a budget-effective price. We're the first crypto project to enable the creation of coins, tokens ridiculously fast and easy. Overfeat is a leading brand in Bitcoin and cryptocurrency industry related development work and to make our work faster, better and safer, we've decided to unveil this tool to the public. You can now avoid the hassle of coding and deploying your Ethereum token, Overfeat does it all - automatically. Right after your payment, we generate the code and deploy it on the network immediately. Furthermore, you get the token's source and ABI which is available for further editing. The source code is fully available to you so you can be assured that there's no exploit in it. Your code will be fully ERC-20 compliant, this means that majority of the exchanges and wallets will support it. Now, you can confidently generate your coins and tokens as per your needs in no time. Fill out the form above to create your coin instantly. We also offer custom Solidity development. If you're interested, please contact us by clicking this link.